Dans le cadre de "... ce Parnasse de la Viole imaginaire", "pour Marin Marais, j'ai choisi les deux Suites du Second Livre de Pièces de Viole, que de toute évidence, il dédia à ses deux principaux "Maîtres" (Sainte-Colombe pour la viole et Lully pour la musique) et qui finissent chacune par leur "Tombeau" respectif." "... in this imaginary Parnassus of the Viol", "from Marin Marais, I have chosen the two Suites from his Second Livre de Pièces de Viole, which Marais conspicuously dedicated to his two principal masters *Sainte-Colombe under whom he studied the viol, and Lully, his music master), each of which concludes with its respective "Tombeau"." This is essentially what J.A. Sadie had to say about the 3 cd's. "Although the existence of the music of Sainte-Colombe le fils has been known for some time, it is rarely performed. Savall has remedied the situation by recording all that is known, and it is revelatory, especially when juxtaposed with Marais’ music. It was perhaps inevitable that the son’s music owed more to the father’s than did Marais’. Lully, after all, was Marais’ true mentor, and it was Marais’ long apprenticeship at the Opéra that sharpened his skills as a composer and a communicator.Marais worked with Sainte-Colombe le fils only a very short time. And yet, as you will hear, the son developed his own distinctive voice, rather as CPE Bach later did. The formal disciplines of Lully are absent from his suites and yet they have moments of rhetorical power and they range widely in their expression. They are more self-indulgent, more wayward than those of Marais. Like his father, Sainte-Colombe le fils makes frequent use of the seventh string and chords, although they lack the grace of those of the other composers and the harmonic richness of Marais. Savall’s performances may seem surprisingly unsentimental, but at least for me they reflect a deep engagement with the music, for which I am grateful. It is surely not by chance that Savall chose to record this music on a 1697 seven-string instrument made in London by Barak Norman. Does he think Sainte-Colombe le fils may have asked or inspired the English maker to add a seventh string to some of his renowned bass viols?" Naulleau souligne le fait que Savall a déjà enregistré cette « Suite en si mineur » en 1975 en compagnie d’Anne Gallet et Hopkinson Smith. L’enregistrement de 2003 apporte un regard nouveau sur cette œuvre de Marin Marais. Il s’agit d’une vision plus intérieure, plus austère. Établissant la comparaison entre la vision de 1975 et celle de 2003, Naulleau écrit : « En 1975, l’espoir et la mélancolie apaisaient ici l’amertume » et il ajoute « l’archet de Savall sollicite de constants écarts de dynamique, trace une ligne à la fois plus heurtée et, paradoxe, plus ample qu’en 1975. Le geste est moins harmonieux, parfois moins véloce ». Naulleau underlines the fact that Savall recorded that same « Suite en si mineur” in 1975, but with different musicians (Anne Gallet and Hopkinson Smith). 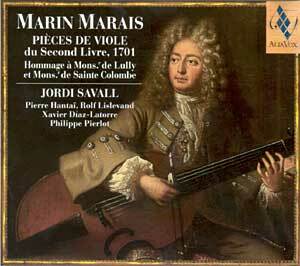 Through this new interpretation, undertaken 28 years later, Savall sheds a new light on this work by Marin Marais. In making a comparison between Savall’s vision of 1975 and that of 2003, Naulleau writes: “In 1975, hope and melancholy were soothing the sourness”, and he adds, “ Savall’s bow provides constant variations in dynamics, it draws a line which is more irregular and paradoxically, more ample than in 1975. The gesture is less harmonious, at times less swift”. Faisant référence à la parution simultanée des enregistrements consacrés à Marin Marais et à Sainte-Colombe fils, et regroupés en un coffret de trois CD, Stéphan Perreau qualifie le tout de "monument Savall". Il souligne le fait qu'il s'agit probablement là d'une nouvelle intégrale qui mènera Savall à travers l'univers de la viole. Il a peu â dire de ces enregistrements, si ce n'est que d'après lui "le jeu de l'interprète s'est affiné, a mûri s'il est encore possible, capté au plus près de l'instrument dont on devine les moindres courbes, les moindres veines du bois qui le composent." Et il conclut en ces termes: "Du grand art poussé à l'extrême. " Referring himself to the simultaneous edition of the recordings devoted to Marin Marais and Sainte-Colombe the younger, (which were issued as a three CD set - Alia Vox AV9829), Stéphan Perreau describes this event as a "Savall monument". He mentions the fact that this is probably the beginning of a new integral which will take Savall across the universe of the viola da gamba. He has little to say about these recordings. According to him, Savall's "...playing is more refined, more ripened if at all possible in his case. The recording is made as close as possible from the instrument. One can detect all the shades, all the curves the sound is made of." He concludes by saying: "This is art to the utmost". Le commentaire de Roger Tellart englobe les trois disques parus en coffret sous le titre "Le Parnasse de la Viole) (Alia Vox AV9829-A-C ). The original text is no longer available on the web. This reviewer's comment is about the entire 3CD set entitled "Le Parnasse de la Viole" and issued as Alia Vox AV9829 - A-C ). "I can’t imagine these pieces played more movingly. In a richly recorded session, Savall recognizes and beautifully evokes Marais’s drama, the melancholy and sensuousness of his world with its mixture of formality and expressiveness. The players are recorded very closely—one hears Savall’s sniffing and occasional moans as well as his viola da gamba. It is worth hearing those intrusions, given the lushness of the sound that comes with them. Some listeners might find Savall over the top in his interpretations: if Casals had played viola da gamba, this is the way he would have sounded. To my ears, he has enlivened and illuminated a rarely played, valuable, body of music." "En rêvant d’une collection qui pourrait réunir, dans ce Parnasse de la Viole imaginaire, de si belles musiques pour la viole, il m’a semblé nécessaire de l’inaugurer avec les compositions de Monsr. de Sainte Colombe le fils et de Marin Marais, probablement les deux meilleurs élèves de Mr de Sainte Colombe le père, en son temps le plus grand « Maître » de l’école française de viole. Les Six «Suittes» pour la Basse de Viole seule de Monsr. de Sainte Colombe le fils sont le témoignage précieux d’un violiste et d’un musicien exceptionnel. Il présente, développe et synthétise les manières les plus diverses de jouer la basse de viole seule, avec l’alternance du « Jeu de Mélodie », du « Jeu d’Harmonie » et du « Jeu de s’accompagner soy-même » tout en développant un langage d’une grande fantaisie, de poésie et de tendresse. Son art austère mais toujours éloquent, anticipe sous certains aspects le langage instrumental et la dimension expressive des Six «Suites» pour Violoncelle et Viola pomposa de J.S. Bach. Pour Marin Marais, j’ai choisi les deux Suites du Second Livre de Pièces de Viole, que de toute évidence, il dédia à ses deux principaux «Maîtres» (Sainte Colombe pour la viole et Lully pour la musique) et qui finissent chacune par leur «Tombeau» respectif. L’inspiration, la force expressive et la douceur évocatrice dans la maîtrise et la compréhension du caractère de chacune de ces deux personnalités font de ces Suites des chef-d’œuvres de la musique de chambre et certainement le meilleur hommage que pouvait leur rendre, celui dont son Maître Monsr. de Sainte Colombe avait dit : « qu’il avoit des Elèves qui pouvoient surpasser leur Maître, mais que le jeune Marais n’en trouverait jamais qui le surpassât » (Titon du Tillet, Le Parnasse françois 1727)." Jordi Savall, Mexico, 25 mars 2003. "While musing over a collection that could bring together such beautiful pieces for the viol in this imaginary Parnassus of the Viol, I felt it appropriate to begin with the compositions by Sainte Colombe the Younger and Marin Marais, probably the two most outstanding pupils of Sainte Colombe the Elder, who was, in his time, the greatest “master” of the French viol school. The six “Suittes” for solo bass viol by Sainte Colombe the Younger are the valuable testimony of an exceptional violist and musician. He presents, develops and synthesizes the most diverse ways of playing the solo bass viol, alternating the melodic, harmonic and “self-accompaniment” styles while at the same type developing a language of great imagination, poetry and tenderness. In some respects, his austere but unfailingly eloquent art foreshadows the instrumental language and expressive range of J.S. Bach’s Six Suites for Violoncello and viola pomposa. From Marin Marais, I have chosen the two Suites from his Second Book of Viol Pieces, which Marais conspicuously dedicated to his two principal “masters” (Sainte Colombe, under whom he studied the viol, and Lully, his music master), each of which concludes with its respective “Tombeau”. The inspiration, expressive power and haunting delicacy in the command and sensitivity to the character of each of the two figures evoked make these Suites masterpieces of chamber music and certainly the best tribute that could have been paid by one of whom Monsieur de Sainte Colombe the Elder remarked, “that he had pupils who were capable of surpassing their master, but that there were none who would surpass the young Marais” (Titon du Tillet, Le Parnasse François, 1732)." Jordi Savall, Mexico, March 25, 2003.